This article originally appeared in The Tyee. Kinder Morgan's decision to suspend work on its controversial $7.4-billion Trans Mountain pipeline looks like a another corporate attempt to blackmail Canadian governments. On Sunday the Texas-based company, which emerged from the ashes of scandal-ridden Enron, abruptly announced it was suspending all "non-essential" work on the export pipeline. Steve Kean, CEO of Kinder Morgan Canada, blamed the B.C. government for the suspension — even though the National Energy Board has not approved construction for any portion of the project but the Westridge marine terminal in Burnaby. Even Kinder Morgan has repeatedly acknowledged the reality of setbacks in presentations to investors, citing "a potential unmitigated project delay to December 2020" as recently as last month. Still, Kean blamed B.C. "What we have is a government that is openly in opposition and has reaffirmed that opposition very recently," he said. But aren't democracies supposed to challenge projects that impose unprecedented economic and environment risks on their citizens? Wouldn't a tanker spill of diluted bitumen in the Salish Sea, where one-third of western Canada's population lives, be an economic and environmental catastrophe, devastating tourism, property values and marine life? Wouldn't the doubling of tolls on the expanded pipeline, as approved by the National Energy Board, raise gas prices for British Columbian motorists by $100 million a year? The pipeline now supplies southern B.C. with most of its petroleum. Won't Alberta, by exporting diluted bitumen to Asian refineries, repeat the original Canadian sin of failing to add value to resources at home, giving up thousands of jobs and billions in revenue? How can exporting one of the world's most carbon intensive fuels help fight climate change? And can't corporations with viable projects accommodate citizens, courts, First Nations and economists who think such costs and liabilities should be properly accounted for? She told The Tyee that "Kinder Morgan is looking for an exit strategy, but it likely includes a need to demonize Ottawa in order to set the stage for a suit under NAFTA." 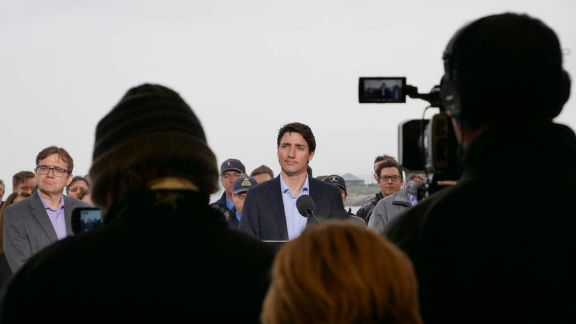 The best evidence from experts shows that Kinder Morgan, the Canadian government and Notley have misrepresented the pipeline's illusory benefits. The Houston-based firm that Prime Minister Justin Trudeau and Alberta Premier Rachel Notley now salute as a defender of Canada's national interest is the spawn of Enron, found guilty of accounting fraud and corruption. The energy trader's collapse cost shareholders $74 billion and killed 20,000 jobs. They include Richard Kinder, a Texas billionaire and Kinder Morgan's chair. He worked at Enron for 16 years. Jordan Mintz, the chief tax officer, served as the vice-president of Enron's tax division from 1996-2000. Kean, the man now baiting Canadian governments, worked as Enron's senior vice-president of government affairs. And so on. But after a Wall Street analyst suggested the third largest energy company in North America wasn't spending enough to maintain its pipelines or returning value to investors, the company's share price fell. Kinder Morgan's stock value plummeted in 2015 and continues to languish. Lower oil prices and rising debt put its largest capital project on shaky ground. Allan says investors recognized a year ago that the Trans Mountain project didn't make commercial sense. As investor interest waned, Allan said, Kinder Morgan couldn't raise debt or equity in the U.S. markets or find a joint-venture partner. Richard Kinder explained the move in a conference call with investors: "So we were able to strengthen KMI'S balance sheet using the IPO proceeds to pay down debt… "
"And now we learn from Premier Notley and Kinder Morgan Canada CEO Steven Kean that conversations with Alberta for financial support have taken place," says Allan. Rachel Notley, Canada's leading petro politician, apparently can't wait to pour taxpayers' money into a project that the market views as high risk and that British Columbians regard as a threat to their best interests. "Alberta is prepared to do whatever it takes to get this pipeline built — including taking a public position in the pipeline," Notley said Sunday. "The project is not commercially viable and, even before it's built, Kinder Morgan is looking for a bailout," she said. "If Kinder Morgan's long-term contracts for moving 700,000 barrels of bitumen and oil on a controversial pipeline were solid, would Kinder Morgan now be blaming the government of B.C. for its problems?" But Trudeau and Notley think it's OK to embrace a debt-ridden U.S. company so it can export, via tankers, unrefined bitumen to Chinese refineries where the upgraded resource can enrich the authoritarian Communist party.